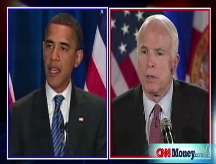 John McCain says Barack Obama would raise government spending, while he'd cut it. He's probably right, but that's not the whole story. NEW YORK (CNNMoney.com) -- Republican presidential nominee John McCain has hammered home the message that he hates pork and wants to balance the budget by 2013. And in accepting the Republican nomination on Thursday night, McCain sought to highlight the differences between his fiscal plans and those of Democratic nominee Barack Obama. 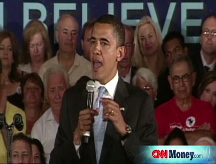 CNNMoney.com's series, Myths, Half-Truths and the Facts, assesses McCain's claim about how he and Obama would differ on government spending. The claim: "I will cut government spending. He will increase it," McCain said. The top line: McCain is likely right, even though both candidates' spending cut proposals are tough to achieve. And the net effect of McCain's tax cut and spending cut proposals is likely to be a deficit that is similar to if not larger than Obama's, budget experts say. The facts: Both candidates promise to realize savings by cutting corporate tax loopholes, reducing troops in Iraq and eliminating (McCain) or reducing (Obama) budget earmarks. McCain also promises to freeze spending on government programs for one year to assess which ones are working and which aren't. And he's vowing to slow growth in mandatory spending, such as that on Social Security and Medicare. Put aside for the moment that budget experts say several of the candidates' spending cut proposals are ambitious if not unrealistic. Obama has said he'd use savings to help pay for his new programs, while McCain has said he'd use them to balance the budget by the end of his first term in office. "It's likely that McCain would keep spending lower than Obama would," said Bob Bixby, executive director of the Concord Coalition, a deficit watchdog group. "But that's different than talking about the candidates' effects on the deficit." The deficit is the result of spending and tax policies. Both candidates have proposed expensive tax policies, but McCain's is estimated to be more expensive. The Tax Policy Center estimates that Obama's proposals could cost the government up to $2.9 trillion in revenue over 10 years. McCain's could cost as much as $4.2 trillion. Those figures are based on a scenario in which the 2001 and 2003 tax cuts expire, which they are set to do by 2011 under current law. If you assume those cuts are extended, which the campaigns contend is the current expectation among policymakers, Obama's plan is estimated to actually raise $596 billion and McCain's to lose $2.9 trillion. But none of those numbers includes the estimated costs of their plans to revamp the health care system. Obama's plan is estimated to cost $1.6 trillion; McCain's $1.3 trillion. That means the candidates would either have to raise taxes, cut government spending or increase the government's debt load - which is already pretty top heavy. This year's deficit alone is kissing up to $500 billion. And the country's total debt, which includes the annual deficits accrued over time, is expected to top $10 trillion by next year. The bottom line: Both candidates have proposed economic plans that experts don't expect will either raise enough revenue or cut spending sufficiently to pay for them in their entirety. But if you just consider the spending side of the equation, McCain's numbers are likely to be lower than Obama's.